As the publishing industry has jumped wholeheartedly into the emotional Vampire trend that's seen the release of the Twilight novels, it's nice to come across a book that was published during this that really brings the horror back to the style of story. 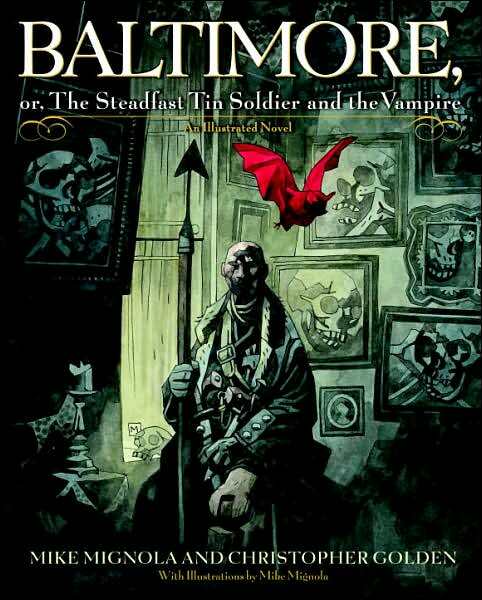 Baltimore, or The Steadfast Tin Soldier and the Vampire, by Christopher Golden and Mike Mignola is an engrossing read that both deals with vampires, and brings in a proper horror feeling to the story. This unconventional novel was first recommended to me a couple of years ago, where I was drawn to the absolutely fascinating cover, drawn up by comic book artist and author Mike Mignola. Mignola, the creator of the Hellboy and BPRD comic series, is a favorite of mine, not only for his excellent artwork, but for his strange, gothic stories that pull me in. When I came across the book at a convention last month, I immediately picked up the book, and had it signed, as author Christopher Golden was one of the attendees. Lord Baltimore, a soldier in the English military during the first World War, leads a night attack against German soldiers, when his entire squad is killed when they are spotted. Wounded, he sees something frightening: creatures coming out of the dark to feed on the men under his command. He attacked one of the giant bats, striking it in the face with his bayonet, scarring it. He is attacked in turn, and loses his leg as a result. Those actions push the story into action, and the rest of the book is preoccupied with not Baltimore’s story, but of three friends of his: Doctor Lemuel Rose, the doctor who treated Baltimore’s leg after the attack (and ended up amputating it), Thomas Childress , a childhood friend of Baltimore’s, and Demetrius Aischros, who brought Baltimore home from the battlefield. Each man was summoned by Baltimore, and as they await his presence, it unfolds that each of them has had an encounter with the supernatural, and that they would help him in his mission. Following Baltimore’s attack, Red King (the leading vampire who was wounded in the face) unleashes a plague against Europe in retaliation for his disfigurement. People passed away across the continent, and turned into vampires themselves, grinding the war to a halt as the death toll climbs. As Baltimore returns home, the King exacts his own revenge on his attacker by killing his family, then his wife, in an effort to break the man. The opposite happens, and Baltimore goes on a quest to kill the Red King. As the stories are told, they blend together towards a finish that was entirely unexpected, but rewarding. Baltimore, or The Steadfast Tin Soldier and the Vampire is s a good example of where a genre has been changed from largely traditional details, yet is able to stand on its own. Where books such as Stephanie Myer’s Twilight have been criticized because of the liberties that have been taken with the books, Baltimore was able to capture the horror of such individuals and come out as a work who’s antagonist doesn’t feel shortchanged. Having not read Twilight yet, I can’t accurately compare the changes to some of the more rooted versions of the canon, but I can say that Baltimore reaffirms my belief that canon isn’t always paramount, and that modern stories that take on vampires shouldn’t be rooted as firmly to Bram Stoker’s Dracula as we’d like. Baltimore sheds away the Victorian gothic styling that comes with the territory and advances towards World War I. With its trench warfare, rapid advances in weapons and seemingly pointless nature to the attacks, the battlefields in France and Germany are the perfect setting for a horror novel, and under Golden and Mignola’s care, a time of industrial realism is blended together with a sort of surreal supernatural amongst each of the characters, in Italy, England and South America. Moreover, vampirism here seemed to be carried on by disease – a horrifying method of death in and of itself – rather than the bites and lives in coffins. These vampires are pretty scary in their own right – taking over towns, coming out at night and generally not good people to be around, especially as they feed and decimate the population of Europe. In the end, the book serves as an interesting counterpart to the First World War. By the end, it becomes increasingly clear that both sides have become larger than their individual selves: they represent a larger picture, and with the war as a background, they have become two larger forces that collide endlessly, tirelessly and each unable to yield to the other. Baltimore is a fascinating read, one that pulls in the strange worlds that Mike Mignola puts together, (along with his art on every page) and the excellent storytelling of Christopher Golden. The story shows that the vampire craze can be adapted into its own different ways, but that it retains some of the core facets: there are some things that are more horrifying than death.